Our event was great success. We had about 20 vehicles for our car show as well as about 6 test vehicles. The participation from some local sponsors was out standing. We had test drives provided by Tesla Woodland Hill, Mission Hills Nissan, And Rydell Chevrolet. Our Exhibitors and sponsors included AAA, Chatsworth tires, Anytime fitness, Ralph's, Adaptive Services and Design, The Hive Chatsworth, and many others. We had a snack and ice cream vendor providing treats, as well as participation from local restaurants serving food. Overall, there was an overwhelming positive response to the event and the way it was organized. We had a wonderful team of about 20 volunteers that graciously gave their time to help . We had a great time and look forward to growing the event next year. 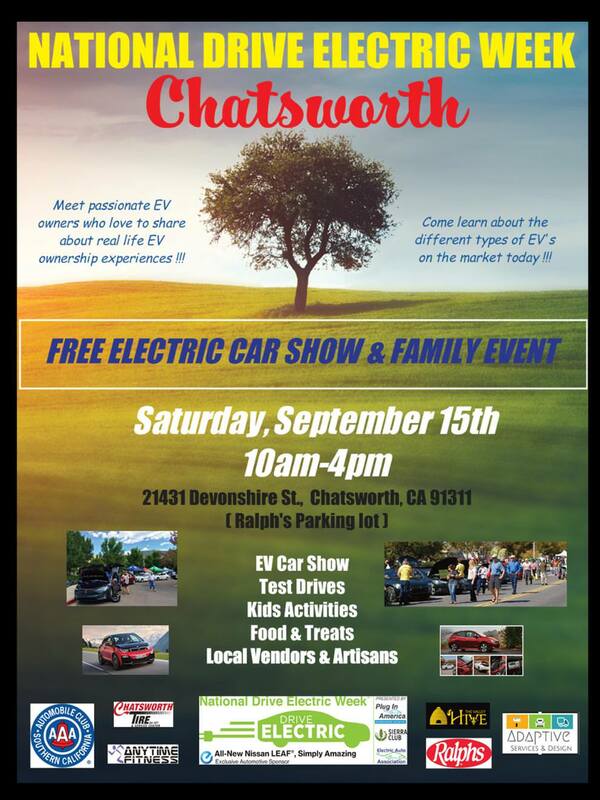 This was a great way to get the word out about EV's, and the potential to make this a HUGE event in chatsworth next year is very promising. I look forward to hosting this wonderful event again next year. Thank you for the opportunity. EV Car Show in Front of Chatsworth Ralph's, our Host. 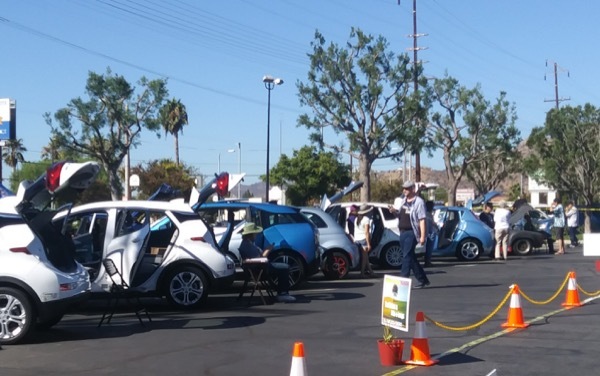 This event is part of the annual National Drive Electric Week taking place in over 200 cities nationwide and an opportunity to promote the myriad benefits of plug-in vehicles in cities coast to coast. Plug-in vehicles have enabled tens of millions of miles of cleaner, oil-free driving. Drive Electric Week events—like parades, electric tailgate parties, test-ride events, and press conferences—will be taking place in cities nationwide on September 8th to the 16th. Electric Vehicle Car Show - Nissan LEAF, BMW i3,Tesla, Chevy Volt, Ford C-Max, etc. There are currently 155 attendees registered. Registered attendees report 669,411 electric miles driven.